Sunday 27 September 2015, 10am - 3pm at University of Worcester, Sheila Scott Building, Turnpike Close, St John's, Worcester, WR2 6AB. Useful tools and ideas for dance practitioners and teachers to use when choreographing and dancing with children with profound disabilities. Focusing on bodies and props, this therapeutic day of dance is led by dance movement psychotherapist Laura Glendenning and dance practitioner Cat Weager, and will include a visit to Worcester Snoezelen. Cost - £25. Visit www.dancefest.co.uk to book. Exim Dance offers employment opportunities for people who are disabled including roles as composers, dancers and teachers. Exim are always looking to work with new dancers so please get in touch. Independent Dance employs artists as required including artists who are disabled. Their building is fully wheelchair accessible. Please see their website for details of any current opportunities. Attenborough Arts Centre invites anyone in the community to engage with the arts. Our current arts programme pilots new approaches to performance and creative learning, supporting local and national artists to take risks and try new ideas, especially those with emerging careers and disabled artists. We encourage partnerships to develop artists cross-over and collaboration with different art forms. We are looking to develop further work, aiming to foster debate with artists, students, academics and wider audiences. Our new exhibitions programme focuses on art that is relevant, engaging and accessible, critical and progressive. Our exhibitions will have a social motivation exploring the changing role of contemporary art, its local and global relevance; supporting practical, aesthetic, and poetic new approaches to our society, our environment and our place within the two. Please see our website for further information about current and upcoming employment and volunteering opportunities for disabled artists. Taking Flight often run courses on various topics including puppetry, facilitator training, Shakespeare, audition technique. These courses are aimed at disabled, D/deaf, sensory impaired and non disabled participants and foster an inclusive learning environment. Please contact us to be added to our training mailing list. High Fliers is a professional training and performance company for gifted and talented dancers with learning disabilities. Dancers benefit from a free professional training day each week during term time, including ballet and contemporary dance technique, Pilates, fitness training, creative practice and performance skills, all led by industry professionals. Performance opportunities are paid, in line with equity rates, making High Fliers one of the first offerings of its kind. Offers commissions for professional disabled artists and companies. There will be two open calls for submissions throughout the course of the three year programme as well as Research & Development Awards. Support is offered to companies and artists interested in applying. Please see the website for further details and information on how to apply. The Funky Llama Festival offers opportunities for national, regional and local artists to showcase their work in dance, puppetry, music, theatre and comedy acts. No fees can be paid but expenses for performers outside the area can be covered. Contact the organisation for details of the next call out for performers for the Festival and also for opportunities at Funky Llama Club Nights. Please contact Arts Care Gofal Celf for details of any semi-professional or other training opportunities. Please contact Shetland Arts for details of any semi-professional or other training opportunities. Please contact Dance House for details of any semi-professional or other training opportunities. Please contact Dance Base for details of any semi-professional or other training opportunities. Please contact Citymoves Dance Agency for details of any semi-professional or other training opportunities. Please contact Dazl for details of any semi-professional or other training opportunities. Please contact TAN Dance for details of any semi-professional or other training opportunities. Please contact Rubicon Dance for details of any semi-professional or other training opportunities. Please contact Powys Dance for details of any semi-professional or other training opportunities. Please contact Dawns i Bawb Dance for details of any semi-professional or other training opportunities. Please contact NEW Dance for details of any semi-professional or other training opportunities. Please contact Yorkshire Dance for details of any semi-professional or other training opportunities. Please contact Plymouth Dance for details of any semi-professional or other training opportunities. Please contact Pavilion Dance South West for details of any semi-professional or other training opportunities. Please contact Dance in Devon for details of any semi-professional or other training opportunities. Please contact Bath Dance for details of any semi-professional or other training opportunities. Please contact Activate for details of any semi-professional or other training opportunities. Please contact South East Dance for details of any semi-professional or other training opportunities. Please contact Ludus Dance for details of any semi-professional or other training opportunities. Please contact Dance Manchester for details of any semi-professional or other training opportunities. Please contact Dance Cumbria for details of any semi-professional or other training opportunities. Please contact North West Dance for details of any semi-professional or other training opportunities. Please contact Cheshire Dance for details of any semi-professional or other training opportunities. Please contact Dance City for details of any semi-professional or other training opportunities. Please contact The Place for details of any semi-professional or other training opportunities. Please contact East London Dance for details of any semi-professional or other training opportunities. Please contact deda for details of any semi-professional or other training opportunities. Please contact Dance4 for details of any semi-professional or other training opportunities. Please contact artsNK for details of any semi-professional or other training opportunities. Please contact Dance East for details of any semi-professional or other training opportunities. Please contact DanceDigital for details of any semi-professional or other training opportunities. Please contact the organisation direct to find out about current and upcoming professional development opportunities for dance artists who are disabled in Wales. Please contact Arts Care Gofal Celf for details of any current and upcoming professional development opportunities accessible to artists who are disabled. Please contact Sheltand Arts for details of any current or upcoming professional development opportunities for artists who are disabled. Dance development agencies and organisations run professional development workshops and sessions for professional and emerging dance artists and choreographers. Please contact Dance House for details of their current programme. Dance development agencies and organisations run professional development workshops and sessions for professional and emerging dance artists and choreographers. Please contact Dance Base for details of their current programme. Dance development agencies and organisations run professional development workshops and sessions for professional and emerging dance artists and choreographers. Please contact Citymoves Dance Agency for details of their current programme. Dance development agencies and organisations run professional development workshops and sessions for professional and emerging dance artists and choreographers. Please contact DU Dance for details of their current programme. Dance development agencies and organisations run professional development workshops and sessions for professional and emerging dance artists and choreographers. Please contact Dazl for details of their current programme. Dance development agencies and organisations run professional development workshops and sessions for professional and emerging dance artists and choreographers. Please contact TAN Dance for details of their current programme. Dance development agencies and organisations run professional development workshops and sessions for professional and emerging dance artists and choreographers. Please contact Rubicon Dance for details of their current programme. Dance development agencies and organisations run professional development workshops and sessions for professional and emerging dance artists and choreographers. Please contact Powys Dance for details of their current programme. Dance development agencies and organisations run professional development workshops and sessions for professional and emerging dance artists and choreographers. Please contact Dawns i Bawb for details of their current programme. Dance development agencies and organisations run professional development workshops and sessions for professional and emerging dance artists and choreographers. Please contact DanceXchange Dance for details of their current programme. Dance development agencies and organisations run professional development workshops and sessions for professional and emerging dance artists and choreographers. Please contact dancefest for details of their current programme. Dance development agencies and organisations run professional development workshops and sessions for professional and emerging dance artists and choreographers. Please contact Swindon Dance for details of their current programme. Dance development agencies and organisations run professional development workshops and sessions for professional and emerging dance artists and choreographers. Please contact Take Art for details of their current programme. Dance development agencies and organisations run professional development workshops and sessions for professional and emerging dance artists and choreographers. Please contact Plymouth Dance for details of their current programme. Dance development agencies and organisations run professional development workshops and sessions for professional and emerging dance artists and choreographers. Please contact Pavilion Dance South West for details of their current programme. Dance development agencies and organisations run professional development workshops and sessions for professional and emerging dance artists and choreographers. Please contact Dance in Devon for details of their current programme. Dance development agencies and organisations run professional development workshops and sessions for professional and emerging dance artists and choreographers. Please contact Bath Dance for details of their current programme. Dance development agencies and organisations run professional development workshops and sessions for professional and emerging dance artists and choreographers. Please contact Activate for details of their current programme. Dance development agencies and organisations run professional development workshops and sessions for professional and emerging dance artists and choreographers. Please contact South East Dance for details of their current programme. Dance development agencies and organisations run professional development workshops and sessions for professional and emerging dance artists and choreographers. Please contact MDI for details of their current programme. Dance development agencies and organisations run professional development workshops and sessions for professional and emerging dance artists and choreographers. Please contact Dance Manchester for details of their current programme. Dance development agencies and organisations run professional development workshops and sessions for professional and emerging dance artists and choreographers. Please contact North West Dance for details of their current programme. Dance development agencies and organisations run professional development workshops and sessions for professional and emerging dance artists and choreographers. Please contact Cheshire Dance for details of their current programme. Dance development agencies and organisations run professional development workshops and sessions for professional and emerging dance artists and choreographers. Please contact Dance City for details of their current programme. Dance development agencies and organisations run professional development workshops and sessions for professional and emerging dance artists and choreographers. Please contact Peter Laycock, Project Officer, for information about professional development opportunities - 020 7121 1036 or peter.laycock@theplace.org.uk. Dance development agencies and organisations run professional development workshops and sessions for professional and emerging dance artists and choreographers. Please contact Sadler's Wells (Learning) for details of their current programme. Dance development agencies and organisations run professional development workshops and sessions for professional and emerging dance artists and choreographers. Please contact Greenwich Dance for details of their current programme. Dance development agencies and organisations run professional development workshops and sessions for professional and emerging dance artists and choreographers. Please contact deda for details of their current programme. Dance development agencies and organisations run professional development workshops and sessions for professional and emerging dance artists and choreographers. Please contact Dance4 for details of their current programme. Dance development agencies and organisations run professional development workshops and sessions for professional and emerging dance artists and choreographers. Please contact artsNK for details of their current programme. Dance development agencies and organisations run professional development workshops and sessions for professional and emerging dance artists and choreographers. Please contact Dance East for details of their current programme. Dance development agencies and organisations run professional development workshops and sessions for professional and emerging dance artists and choreographers. Please contact DanceDigital for details of their current programme. Please contact Sadler's Wells (Learning) for details of any employment or other professional opportunities for disabled artists. Please contact Dance House for details of any employment or other professional opportunities for disabled artists. Please contact Citymoves Dance Agency for details of any employment or other professional opportunities for disabled artists. Please contact Dazl for details of any employment or other professional opportunities for disabled artists. Please contact TAN Dance for details of any employment or other professional opportunities for disabled artists. Please contact Rubicon Dance for details of any employment or other professional opportunities for disabled artists. Please contact Powys Dance for details of any employment or other professional opportunities for disabled artists. Please contact Dawns i Bawb for details of any employment or other professional opportunities for disabled artists. Please contact NEW Dance for details of any employment or other professional opportunities for disabled artists. Please contact Yorkshire Dance for details of any employment or other professional opportunities for disabled artists. Please contact DanceXchange for details of any employment or other professional opportunities for disabled artists. Please contact Dancefest for details of any employment or other professional opportunities for disabled artists. Please contact Swindon Dance for details of any employment or other professional opportunities for disabled artists. Please contact Take Art for details of any employment or other professional opportunities for disabled artists. Please contact Pavilion Dance South West for details of any employment or other professional opportunities for disabled artists. Please contact Dance in Devon for details of any employment or other professional opportunities for disabled artists. Please contact Bath Dance for details of any employment or other professional opportunities for disabled artists. Please contact Activate for details of any employment or other professional opportunities for disabled artists. Please contact South East Dance for details of any employment or other professional opportunities for disabled artists. Please contact MDI for details of any employment or other professional opportunities for disabled artists. Please contact Ludus Dance for details of any employment or other professional opportunities for disabled artists. Please contact Dance Manchester for details of any employment or other professional opportunities for disabled artists. Please contact Dance Cumbria for details of any employment or other professional opportunities for disabled artists. Please contact North West Dance for details of any employment or other professional opportunities for disabled artists. Please contact Cheshire Dance for details of any employment or other professional opportunities for disabled artists. Please contact Dance City for details of any employment or other professional opportunities for disabled artists. Please contact The Place for details of any employment or other professional opportunities for disabled artists. Please contact Greenwich Dance for details of any employment or other professional opportunities for disabled artists. Please contact East London Dance for details of any employment or other professional opportunities for disabled artists. Please contact deda for details of any employment or other professional opportunities for disabled artists. Please contact Dance4 for details of any employment or other professional opportunities for disabled artists. Please contact Dance East for details of any employment or other professional opportunities for disabled artists. Please contact Arts Care Gofal Celf for details of any employment or other professional opportunities for disabled artists. Please contact Shetland Arts for details of any employment or other professional opportunities for disabled artists. The Open Arts Monday Players meet weekly to develop their acting and performance skills. The group often works towards large and small scale performances. There are limited places available in the group, please contact eileenopenarts@gmail.com for more information about the group and how to join. The Luminous Soul Dance Project is a group of disabled dancers who meet weekly to develop their skills and creativity in contemporary dance. The group have made a name for themselves through their performances at festivals and showcases in Northern Ireland and London. The Luminous Soul team has worked with many expert choreographers and tutors from around the UK and Northern Ireland. These include the award-winning Candoco Dance Company, Blue Eyed Soul Dance Company, and the world class performers and choreographers, Claire Cunningham, Caroline Bowditch and Marc Brew. The project has been a huge success and some of our Luminous Soul dancers have given performances as professional disabled dancers - a first for Northern Ireland! Please contact the organisation for details of how to join the weekly classes. The Open Arts Community Choir (or Festival Choir as it is sometimes known) is an auditioned group of singers who tackle more challenging music and compete in choral festivals. The choir featured in the BBC One series 'Last Choir Standing'. If you are interested in auditioning for the choir, please phone Beverley Whyte (Music Director) on 028 9024 0765 or email bev@openartsni.org. The Company works with professional writers, directors and artists to create productions staged in a range of venues, from the Millennium Forum to the streets of Derry and local schools. The Company offers its members theatre training in many art forms, including; dance, voice, physical theatre, music, set design, stage management, lighting directing, facilitation skills and script writing. These take the form of master classes with practitioners from throughout the UK. Recent collaborators have included Mind the Gap Theatre Company, Echo Echo Dance Company, Replay Theatre Company and Oscar-nominated Dave Duggan. Please contact the Company for further information about its work and how to join. This in-house integrated dance company offers developmental and CPD opportunities for disabled and non-disabled dancers and choreographers. Please contact the organisation for further information about joining the company and also accessing its short courses. Mess Up the Mess Theatre Company provides opportunities for diverse young people, including young people who are disabled, to create, rehearse and perform work in a range of venues in Wales. Through their Strangers 2 , members are collaborating with youth theatre groups in Hong Kong, Australia and New Zealand. Liveheart is a band with four regular members who meet in our studio on Tuesday mornings to rehearse and record their music. To find out more about opportunities like this with Drake Music Scotland, please contact the organisation. This is a dance session for people with and without disabilities with some dance experience. The class also works towards performances and projects. Contact Attik for details of how to join. Movers Theatre Company provides opportunities for people with a learning disability who have some experience of drama and performance. The Company was formed following requests from the participants in the regular weekly sessions to do more advanced performance work. Movers are managed by a steering group with representation from the performers as well as Speakeasy. Movers have performed at high profile events such as the Opening Ceremony of the Special Olympics 2009, as well as at events attended by Prime Minister Gordon Brown, Minister for Sport Gerry Sutcliffe, and Lord Richard Attenborough. The group meets at Attenborough Arts Centre and perform in a variety of spaces from Day Centres to Theatres as well as developing a workshop programme for the region. If you are interested in joining Movers, please contact the organisation for information. Random Line is a professional arts based organisation producing very high quality work at a national level. People can become involved within this work at several levels: as participants in workshops/events, as participants in projects, as members of an audience or as a core member of the company. Core members are the artists at the heart of the company. To become a core member people must demonstrate a high level of interest, commitment, enthusiasm and have support to enable them to take a full part in a busy programme. Random Line supports people through all stages of this process - starting as participants in projects/workshops and developing into a core member, taking full responsibility for performances and projects. We have seen individuals transform and develop a personal confidence that would be hard to attain through any other process. For more detail please see the case studies on the website at http://www.randomline.co.uk/html/the_company.html. The artistic work of Random Line is developed in collaboration with Artistic Director, Andrew Williams a multi media artist. The Performance Company consists of members who have invited to participate based on their talent. Besides the regular classes, the Company has weekly extra sessions focusing on technique and movement. As well as an annual performance, the Company is also invited to take part in a variety of festivals and conference events such as the City of Culture event in Derry 2013. Indepen-dance has previously performed in Italy, Germany and Spain. Contact the organisation for further information on the Company including details of how to join. Freewheelers comprise a regular company of 18 core performers, with varying degrees of disability. Original productions using film and technology are created to give our performers their full voice, working with professional musicians, writer and technicians to achieve work of the highest quality. Productions are toured to professional venues locally including Farnham Malting, South Hill Park (Bracknell) and The Albany (Deptford). The Company welcome enquiries from keen actors interesting in joining the Company. The Company offers opportunities to untrained disabled people and disabled students on some productions. These include theatre and performance skills training. Contact the Company for details of upcoming opportunities. ReWired DJs are a collective of London based DJs with learning disabilities which offer workshops to people with learning disabilities who are inspired by the thought of playing to a packed house. Workshops take place weekly and cover all aspects of Djing from mastering the equipment to filling the floor. Carousel produces Oksa Bright, an international digital and film festival dedicated to showcasing work from people with learning disabilities. The festival is open to work from talented disabled film-makers, whether professional or amateur. The Baked Bean Dance Company offers members a chance to work with qualified teachers and professional choreographers. It meets twice weekly and is open to new members. Heart n Soul provide support to a portfolio of emerging disabled artists including skills development, opportunities to work with professional artists and performance opportunities. Amici's weekly group of 40+ disabled and non-disabled dancers meet weekly with additional rehearsals scheduled when productions are in development. Productions are large scale and staged in professional venues and Amici has a substantial repertoire of work which is performed throughout the UK. The Company is currently at full capacity and is therefore unfortunately unable to take new members. However, each term Amici hold an open workshop lead by Wolfgang Stange at the Lyric Hammersmith and these are a unique opportunity to experience the Amici "magic". Further details are available on the website. Black Cab Theatre Company is a core ensemble of actors with a learning disability that aim to take their exciting theatre practice to a wider audience. The Company has recently been developing site specific performances and developing the actor's skills to really engage new audiences with the work. The aim is for the ensemble of actors to get a real wage for their work and to reach even more audiences in London and beyond. Devising new work is an important part of what DIY does. Productions are always based on members' experiences, ideas and imaginations and use theatre, music, video and design to tell their stories. Performances take place in Manchester and beyond, touring to schools, professional theatres and community venues. If you are interested in joining DIY Theatre Company, please contact the Company for further information. Carousel offers a number of training and performance opportunities for disabled people. These include: - Blue Camel Club: Provides opportunities for bands, musicians, dancers, DJs, VJs to perform. - Shut Up and Listen: Live music and radio made by artists with a learning disability. - Carousel Choir: A choir of learning disabled young adults who perform at professional venues including Glyndebourne Opera House and Brighton's Corn Exchange. Aerial dance and inclusive practice - please contact the organisation for details of any opportunities for semi-professional artists. The members of Musical Arc are broad ranging in age, culture and background. As a group the aim is to welcome all abilities and to cater for impairments with instruments that suit each individual. Training is provided for members to develop both musically and personally, with many improvements seen in social interaction, confidence and professional approach. The group currently comprises singers, story tellers, percussionists and pitched instrument players, and is open to new sounds as well as the ability to occasionally change which instruments members play. The group undertakes professional public performances in mainstream venues. If you are interested in joining Musical Arc, please contact the organisation for further information. Magpie Dance's Adult Group comprises 15 learning disabled dancers, some of whom have been with the Group since it started, others who have progressed through the Youth Group and adult community classes. The Group focusses on performance and choreographic techniques, working with in-house and guest artists, teachers and choreographers. Dancers are also involved in outreach and education residencies. Six members have created their own choreographic work through the ground-breaking Mentoring Programme, which sees disabled choreographers mentored to create work for non-disabled dancers. Odyssey is an inclusive community group for adults with and without learning disabilities who share a passion for performance. The group's 25 core members continue to meet weekly to work on performance skills, leading towards an annual Christmas production that takes place in the Weston Studio at Wales Millennium Centre. Odyssey is a training ground for actors with learning disabilities. Three members have gone on to perform professionally in Hijinx Theatre tours. Numerous others have progressed to paid employment as actors in our Forum Theatre pieces and workshop assistants on Outreach projects. Odyssey members also gain the opportunity to work with national and international artists to create performances for the Unity Festival and Hijinx Pods. If you are interested in joining Odyssey, please download the form on the Company's website www.hijinx.org.uk/odyssey. Please note there is currently a waiting list for places. Get Changed Theatre Company offers participants opportunities to develop their skills and experience working across a range of art forms including visual arts, theatre, dance, music and film. 2015 is the year of festivals for Get Changed and the group hopes to perform at Exeter Respect, D'Arts and Funky Lama festivals in June and July. If funding is realised, the participants also hope to perform at Holifield in Cornwall in August. The theme of this year's work is Alice's Adventures in Wonderland. Please contact the organisation for details of how to join. Blue Apple Dance Core is an auditioned group for those who wish to take their dancing to the next level. Sessions are aimed at those with dance/movement experience and aim to develop dance technique and performance skills. The group creates dance for touring performances and for shows and events. Candoco delivers performance projects and summer schools for young people alongside mentoring and development support. A number of young people taking part in these opportunities have emerged as young leaders and have taken up professional engagements with dance organisations across London. Contact Candoco for information on current opportunities. Fan Dance Theatre Company are a Brighton based company of performers with and without disabilities who make feature length shows and deliver integrated creative workshops. Performances have taken place at a range of venues including the Blue Camel Club (Brighton), Phoenix Community Centre (Brighton), Chailey Heritage School, (Lewes), Salvation Army (Brighton), Brighton Fringe Festival and the Blue Starfish club (Worthing). Unfortunately, the Company is currently unable to take on any more performers. Celebrity Pig Theatre Company offers devising, performing and training opportunities to actors with learning disabilities. Please contact the Company for further information on how to join. The Streetwise Samba Band have been beating their drums for 15 years and have had several line up changes over that time as old members go on to pastures new. Building on the success of this, SCCW are launching a new Samba Programme for individuals living with disabilities which commenced in February 2014. This new project aims to combine the skills of the Samba band with the skills and experience of SCCW's disability team making this art for accessible to individuals who would not have the opportunity . This is a pilot project to assess potential for future development throughout Northern Ireland. Streetwise Community Circus Workshops (SCCW) has a highly trained and experienced staff who include tutors with over 10 years experience working with people of all ages with disabilities. Workshops are tailored to the specific needs of the group with the full range of circus skills offered. These have proved very successful and SCCW currently runs projects in partnership with Belfast Trust Health Promotion, Northern Trust, National Autistic Society, and Belfast Activity Centre. Workshops can be organised as one off workshops or a programme of workshops leading up to an event or public showcase. Please contact the organisation for further information. Room for Manoeuvre is a five day intensive (usually run during summer holidays) for experienced disabled and non-disabled dancers/artists wishing to create choreography in a supportive lab atmosphere. It offers dancers from diverse backgrounds a unique networking opportunity. Please contact Foot in Hand for details of upcoming opportunities. Indepen-dance provides quarterly training events relating to Inclusive dance practice. These course are facilitated by specialists in their field from across the UK and Europe. Indepen-dance delivers courses on a regular basis to other inclusive dance companies within the UK, Europe and Americas, the most recent course took place in Paraguay 2013. IdeasTap provides professional development through the IdeasTap Spa programme of workshops, seminars, Q&As and CV Clinics. Opportunities to network with other young artists and the IdeasMag which provides practical advice for young artists, can also be accessed via the website. Touchdown Dance deliver training sessions in the core methods and processes the Company works with. These are open to people with and without disabilities. The Company also run training sessions in leadership skills for learning disabled performers/artists. Drake Music Scotland offers training and mentoring programmes for musicians keen to work in the field and CPD is provided for those joining their pool of Associate Musicians. Training and CPD opportunities are also tailored to the needs of teachers, including Soundbeam and music technology training built into Switch ON to Music projects, resources and ongoing support after projects have taken place, short courses and in-service training for instrumental instructors. As part of the musicSPACE programme, Drake Music Scotland provides artistic and technical support for musicians with disabilities alongside recording studio facilities, projects and training. Contact the organisation for further information. Professional development is an important part of Foot in Hand's work and the Company has a strong track record in mentoring, training and working with artists from a wide range of backgrounds, including disabled artists. Please contact the organisation for details of any current or upcoming opportunities. The Company has worked nationally and internationally providing specialist training for professionals in dance and dance film work for people with visual impairments. Please contact the organisation for details of any current or upcoming opportunities. The Lawnmowers Actors have provided theatre, comedy and music workshops alongside forum and legislative theatre training. Please contact the organisation for details of current opportunities. Limelight offers mentoring and professional development opportunities for emerging and established disabled musicians, as well as offering platforms for their music. Please contact the organisation for further information of current or upcoming opportunities. Green Candle run a varied programme of workshops and training programmes for artists and practitioners with and without disabilities. This includes running Inset and Professional Development courses on leading dance with Older People and Early Years for participants with or without disabilities. Baked Bean Pro is an agency open to all members of Baked Bean Theatre and Dance groups which places disabled performers in film and television roles. Amici have produced a Resource Pack and DVD, called 'The Magic of Amici', targeted mainly at Arts Practitioners who would like to learn more about the company and their working practices and as a guide to running workshops "the Amici way". The Hands On web resource provides opportunities for d/Deaf people working in the arts and cultural sectors to share ideas and opportunities, offer support and network. Sign up to the resource at http://be-hands-on.ning.com. Offer peer education, workshops and training sessions for disabled artists. The GUIA EU project connects disabled artists in Northern Ireland connect with disabled artists in Croatia, Poland, Czech Republic, Germany, Rumania and Turkey. Please contact the organisation for details of current and upcoming opportunities. Offer a range of projects and initiatives aimed at emerging and established theatre practitioners and companies. These have included Access All Areas, an open space style event for theatre practitioners interested in making their work as accessible as possible and Agent for Change, a programme which promotes dialogue, discussion and includes artistic master classes. Contact Birds of Paradise for details of current opportunities. Offer training projects and workshops in arts, community and education venues. Contact Wicked Fish for further details. Developing Different Voices: DIY is working in partnership with Curious Minds, the bridge organisation for the North West to support this project which offers networking and professional development to teachers and practitioners working in special schools and SEN settings. DIY Theatre Company is a Training and Support Agency for Arts Award and offers a specialist training programme for professionals aiming to offer Arts Award to young people with learning disabilities. Provides support systems and networks for disabled artists alongside training events and workshops. Please contact the organisation for details of current and upcoming opportunities. Arcadea runs Artist Forums for professional and aspiring professional artists. Please contact the organisation for details of current and upcoming opportunities. Celf has been running an Arts Council of Wales funded Training and Mentoring Programme aimed at artists with learning disabilities and mental health issues since 2009. Using Celf's gallery and studio resources, the programme provides professional development opportunities for artists including mentoring, exhibition and touring opportunities and residency and exchange opportunities in the UK and in Europe. Please contact the organisation for further information. Creative Steps is an initiative launched by Arts Council Wales (ACW) to get a wider range of high quality artistic work created and presented in Wales, by a wider range of people. Through the programme, ACW are supporting Celf o Gwmpas to develop and deliver an exchange programme for disabled artists between Scotland, England and Wales, building partnerships with other organisations that have a reputation for high quality work. The initial planning and research will include partner organisation visits and symposia to inform the development of a full 3 year programme. As well as fully involving the disabled artists in the research, the project will enable them to work with Celf and a consultant to establish their own Artists Forum to take the project forward. Please contact the organisation for further information. The GDance Fellowship Scheme GDance's Fellowship Scheme is designed to enable a range of Dance Leaders, Producers and Artists to achieve their potential through meeting a tailored, agreed set of personal aims. The benefits, dependent on the aims of each Fellow, can include: - mentoring from a professional choreographer, Dance Leader or producer / manager - a contribution to travel and/or training costs to attend courses, performances and conferences - free places on GDance courses - opportunities to shadow, and benefit from observations with, experienced dance practitioners - assisting at GDance events and / or in the office or studio - self-reflection, evaluation and reporting on learning GDance also work closely with the University of Gloucester to host at least one placement student per year. For more information on Fellowships and placements, please contact the organisation. GDance offers a range of training and professional development opportunities for disabled and non-disabled artists and practitioners. Examples of recent opportunities include: - Lead In: An introduction to dance leadership and teaching dance. - Integrated ChoreoLAB delivered in partnership with Pavilion Dance South West and South East Dance, a development and choreographic opportunity for artists working in integrated dance. Wherever possible, GDance seeks to include professional development opportunities (for disabled artists and others, eg. Apprentice dancers, stewardship development) in professional production projects. For details of current opportunities, please contact the organisation. No Limits offer advanced workshops to performing arts students as well as training for teachers. Please contact the organisation for further details. The Foundation produces and collaborates on networking event, training days and workshops for disabled dance artists and practitioners. The Foundation for Community Dance Summer School takes place every year and features courses for dance artists and practitioners across a range of areas including working with disabled and inclusive groups. See the website for details of current opportunities and the summer school. The website also features a dedicated area 'Dance, Deaf and Disabled People, which contains details of courses and conferences and information sources for disabled dance artists and practitioners. Graeae has worked in partnership with Circus Space to run training in trapeze, hoops, silks, rope, aerial work and tightrope walking. Please contact Graeae for details of planned or future circus opportunities. Turtle Key Arts produces and manages performance arts projects and companies. They usually produce projects from conception through to delivery but are also able to supply a more specific element of a project, such as consultancy, fund raising, marketing and production management. Please contact the organisation for further information. Extant's broad training programme takes the participant on a creative learning journey. Extant works: - to develop skills and opportunities for visually impaired artists and - to guide arts venues and services to become more accessible to blind and partially sighted audiences, performers and employees. Extant training workshops have included; writing for radio and the stage, improving performance skills in acting, dance, magic and clown work, Alexander Technique, Feldenkrais and voice workshops. All Extant training is created in collaboration with steering groups made up of visually impaired people. Check the website or contact the team for more information on upcoming opportunities. Attenborough Arts Centre invites anyone in the community to engage with the arts. Our current arts programme pilots new approaches to performance and creative learning, supporting local and national artists to take risks and try new ideas, especially those with emerging careers and disabled artists. We encourage partnerships to develop artists cross-over and collaboration with different art forms. We are looking to develop further work, aiming to foster debate with artists, students, academics and wider audiences. Our new exhibitions programme focuses on art that is relevant, engaging and accessible, critical and progressive. Our exhibitions will have a social motivation exploring the changing role of contemporary art, its local and global relevance; supporting practical, aesthetic, and poetic new approaches to our society, our environment and our place within the two. Please see website for further information about current and upcoming opportunities. Through the Artistic Development programme, Drake Music aims to support disabled musicians to develop their work and careers so that they can play a major part in the wider landscape of the arts and culture. This is done in many ways: including running regional projects such as Connect and Collaborate London; Laboratory days; and Jam & Scratch days, where musicians can play together and test out new work on an audience. Projects are also being developed across different platforms, collaborating with artists and companies from other disciplines - such as writers, visual artists, filmmakers and dancers - creating live performances, online experiences and films/videos. See the website and contact the team for details of current workshops, projects and events. In 2013 Deafinitely Theatre launched the HUB, to bring d/Deaf actors and theatre practitioners together to participate in workshops, tuition and all aspects of theatre. Workshops so far...History of Theatre led by Andrew Muir and Mark Sands to give an overview of the development and styles of drama from Greek to the modern day. Deaf Theatre History workshop led by Simon Floodgate from University of Reading looking at the development and history of deaf theatre. Improvising and Devising led by Steve Harper from "Told By An Idiot" and introducing various games, exercises and even stage combat training. Space, Time, Rhythm & Body - Theatre Before The Word led by Omar Elerian from Bush Theatre giving plenty of tips for either scripted or devised work. Bachir Sachir from International Visual Theatre (Paris) delivered multi-disciplinary strands of acting especially rhythm and timing. The HUB is developing actors profiles and skills through its programme to encourage more participation in mainstream theatres. Contact Deafinitely Theatre for details of upcoming workshops and events. DaDaFest hosts a number of projects, initiatives and workshops outside the festival which focus on Disability and d/Deaf Arts. Contact DaDaFest for details of current projects. DaDa Fest also publishes the Hands On web resource which provides opportunities for d/Deaf people working in the arts and cultural sectors to share ideas and opportunities, offer support and network. Sign up at: http://be-hands-on.ning.com. The Signposting Guide: An on-line resource offering handy tips and hints for disabled people on a range of subjects from applying for a job to diversifying your audiences and presenting your artwork. Caf� Lua runs every second Wednesday of the month (excluding August) at Salisbury Arts Centre - a social get together for artists with disabilities and an informal open space for inspiration and discussion. As well as networking and discussion, every month there is a focus on a particular topic or issue, with occasional workshops and visits to exhibitions or performances in other venues. Link Up Arts produces a regular newsletter for disabled artists and those interested in disability arts. The newsletter is also an opportunity for artists to showcase work. Link Up Arts is keen to explore a range of events to engage disabled artists. - Publishes training opportunities from across Wales in its 'What's On' publication and on its website. - Runs a number of projects which provides skills development across a range of artforms for disabled artists. - Offers an Advisory & Support Scheme for disabled artists to help identify training needs and opportunities. Graeae continues its aim to develop professionally trained disabled artists who will enrich the artistic industry in the UK, reflecting the full diversity of the population. Get in touch with Graeae to find out more about its current and upcoming training programmes. Dancer Training: Stopgap provides bespoke training for dancers which promotes collaboration between disabled and non-disabled dance artists. Teacher Training Programme: Stopgap runs annual one day teacher training workshops for Trinity Laban's Professional Development Programme and at the Royal Academy of Dance as well as workshops at Farnham Maltings. Training sessions can be organised for dance teachers, community dance artists and students on request. Orpheus is an independent specialist college that offers a life-changing programme of independence skills to young disabled adults who are motivated by the performing arts. Please visit their website or contact the organisation for further information on current opportunities and how to apply. - Candoco delivers tailored training for artists through its Teacher Training Intensives, International Labs, Dancer Development Days and Choreographic Hothouses. - Candoco also offers bespoke mentoring and consultancy programmes for artists and institutions and maintains a growing network of Candoco Artists who act as ambassadors of inclusive dance.� - Candoco strives to educate and engage artists, practitioners and the general public in discussion and debate about dance through its In Dialogue events. Please contact the organisation for details of specific current and upcoming opportunities. Learning disabled dancers from the Inclusive Dance Practice Training Scheme (see Professional Development opportunities at Magpie for further information) have gone on to paid work with Magpie Dance as Assistant Facilitators. The dedicated Shape Artists website www.shapeartists.org.uk is a new, specialised digital resource aiming to provide focused space for disabled artists to showcase their work, to promote their own events, and to blog about their practice. It includes artist profiles as well as a place to upload images, sound files, video and the written word. This site is available to disabled artists from any creative discipline and is free to use. Unlimited Shape is a national delivery partner alongside Artsadmin on the Unlimited programme (for more information see www.weareunlimited.org.uk for further information). Unlimited, the three year UK commissioning programme for disabled artists supported by the National Lottery through Arts Council England and Creative Scotland. The Company have worked with professional actors of both stage and screen. They have also taken part in BBC documentaries, training DVDs and screen tests for ITV productions. Extraordinary Bodies is the UK's only professional integrated circus company, and a partnership between Cirque Bijou and Diverse City. The Company make circus for every body. The Company's first show, Weighting, premiered on 22nd September 2013 - a commission by Exeter City Council as the finale to new outdoor arts festival Unexpected 2013. Set on a flying staircase, with a live band and specially created music, Weighting features 9 extraordinary artists who dance, sing and fly high above the audience. A 100-strong choir of local singers (including a signing choir) joined the company for the finale of this first show in a participation project that will be replicated when the show tours in 2014. The bold show explores themes of transformation, risk-taking, equilibrium and the ties that bind people. The creative team includes Billy Alwen and Claire Hodgson as artistic directors, Dom Coyote as Musical Director and Composer, Will Datson as designer and Katie Broome as costume designer. Contact Diverse City or Cirque Bijou for further information on the Company and any upcoming opportunities. GDance seeks to bring inspiring inclusive productions and performance to large, mainstream audiences. GDance actively seeks to involve choreographers and collaborative artists facing disabling barriers in creation of new work to support their career development. - Currently, GDance is doing this through: - Coordination of activities and performance for outdoor events - Production of site-specific (and site generic outdoor) work - Short film production Contact Producer Helen Crocker (helen@gdance.co.uk) / 01452-550 431 to discuss how you could partner with us or get involved. Solar Bear produces theatre productions featuring d/Deaf, disabled and non-disabled actors. For details of current and upcoming opportunities, please contact the organisation. Out of the Darkness Theatre Company perform unique and inclusive theatre and have toured locally, nationally and internationally, performing high-quality pieces involving professional and Out of the Darkness Theatre Company actors working on an equal basis. The company has also worked with a variety of organisations, groups and schools across the UK to help them bring their stories to the stage and share them with audiences and communities in an exciting and engaging way. Please contact the organisation for details of current and upcoming opportunities to work with the Company. Signdance Collective International works with talented d/Deaf, disabled and non-disabled artists from across the Globe and across a range of artistic disciplines. Please contact the Company for details of current opportunities. The Company collaborates with talented professional disabled and non-disabled artists from a wide range of artforms. Contact the Company for details of current opportunities with the Company. No Limits employ disabled and non-disabled performers on their performances and projects. Contact the organisation for details of current and upcoming opportunities. Lung Ha's Theatre Company currently has over 20 learning disabled actors in the Company and training and developing their actors is an integral part of the Company's work. If you are interested in joining the Company, you will need to be 18 years or over with a learning disability and attend an audition. Please contact the Company for details of upcoming auditions. The Company works with deaf and deaf-aware artists and practitioners to create productions which tour to professional venues and schools. Contact the Company for details of any current or upcoming opportunities. Jigsaw Theatre Company works with disabled actors to produce professional productions which tour to theatres and schools. Contact the Company for details of any current or upcoming opportunities. Dark Horse works with talented learning disabled actors in its professional productions. Contact the Company for details of any upcoming auditions or opportunities with the Company. Members of the Company are also drawn from the F2 Foundation Acting Course run by Dark Horse. The Company tour work choreographed by Artistic Director, Rachael Lines and invited guest choreographers, often working with musicians and artists, making intriguing and enigmatic work. FRONTLINEdance perform in a wide variety of settings such as adult day centres, galleries, outdoor events, schools and church halls as well as well known dance venues and theatres; ensuring those who would not normally access it can, and as many people as possible see our work. Extant works with a wide range of visually impaired performers on projects and performances and also produces work by visually impaired artists. Contact the organisation for details of current opportunities. 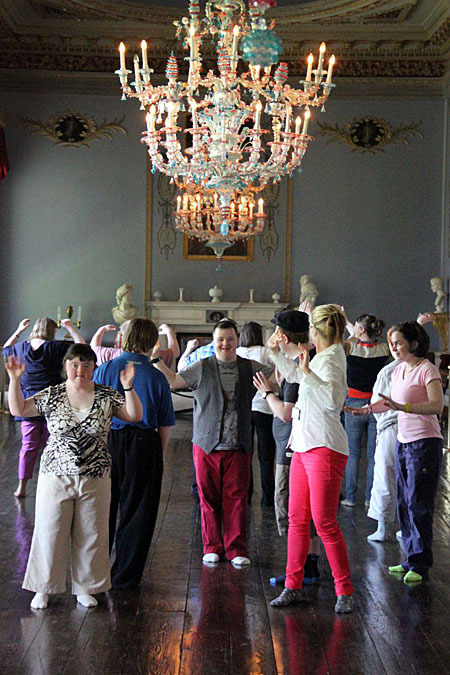 everyBODY Dance works with disabled and non-disabled artists on projects, performances and productions. Please contact the Company for details of any current opportunities for professional artists with the Company. Arc Dance creates and delivers unique performance and workshop opportunities that reflect the quality and inclusive ethos of ActOne's artistic vision. Suzie Birchwood, founder of Act One Arts Base, is both the Choreographer and a performer with the Company. Arc Dance produce inclusive performances that act as a tool to showcase that excellence can be achieved through dance created in an inclusive environment. Tying into the Education and Community Partnerships area of Act One Arts Base's work, Arc Dance are the first point of contact that many people will have with the team and they are integral to all areas of the Company's audience development work. The Company hold auditions for new Company members as and when vacancies arise. Fittings work with a wide range of disabled artists and performers, please contact the organisation for details of any upcoming auditions or opportunities. There are a large number of ways in which professional disabled musicians can engage with Drake Music, including professional commissions, artist in residence, educational and project work. Contact the organisation or see the website for more information. Drake Music is always on the look out for more disabled musicians who have ideas for collaboration or development. DaDaFest is a festival which takes place every two years and which brings artists from across the globe to Liverpool to showcase and celebrate the best in Disability and d/Deaf Arts. The next festival takes place November '14 - January '15. The organisation works with a number of partners to deliver the festival and issues an open call-out for submissions prior to each festival. Contact DaDaFest or check the website for further details. Corali devise and tour original performance work made by a core group of permanent company members (who have a learning disability) and artistic collaborators. Corali is best known for its site-specific performances and for its partnerships with high profile venues such as Tate Modern and South Bank Centre. Shape offers commissions and other professional opportunities for disabled artists, both paid and unpaid. Graeae employ trained d/Deaf and disabled actors, performers, artists and also offer writing commissions. Please contact the Company for details of any current opportunities. Vital Xposure collaborates with a wide range of professional disabled artists all on a fee paying basis. We have Ethical Manager status, recognized by ITC and always pay our cast and crew via ITC /Equity contracts. Candoco employs trained dancers and movement artists with and without disabilities. Please contact the organisation for details of current and upcoming opportunities. Offers one-off commissions for disabled artists alongside opportunities to work on projects. Please contact the organisation for details of current and upcoming opportunities. The British Paraorchestra is looking to recruit more gifted musicians to the ensemble. They are looking for individuals who are: - over 16 years and living in the UK - a prolific/highly able musician (or have been in their recent past) - committed to working as part of an ensemble - All instruments are welcome! If interested, please email a short film /You Tube Clip of a recent audition/ or simply you playing your instrument to info@paraorchestra.com. Please also send a few lines about why you are passionate about joining the British Paraorchestra. The audition process is on a rolling basis, so unfortunately the Company is unable to respond to each application individually. The Company provides opportunities for newly graduated theatre practitioners to work with the group. Please contact the Company for more information. IdeasTap provides funding through their Ideas Fund for young artists and commissions and funds through its Creative Briefs strand, as well as job listings. Please see the website for further information. Audability is a professional band of four musicians supported by Drake Music Scotland, composing and performing their own brand of rock music with songs that have tinges of Latin, Funk and Scottish traditional folk thrown in. Performing their own songs regularly at gigs, concert and festivals across Scotland, Audability have also recently unveiled the video for 'Carry Them Along' which is the first track from their soon to be released album 'Let It Begin'. To find out more about Audability and employment opportunities with Drake Music Scotland, please contact the organisation. Enhance is a new programme led by Zinc Arts to support d/Deaf and Disabled artists working in Performing or Live Arts to create the best work possible, supporting a strong Paralympics legacy and investing in inclusive practice and skills within the sector. Zinc Arts has new, highly accessible residential accommodation and creative spaces and aims to become a national centre of excellence for inclusive arts and cultural wellbeing. The work created through the Enhance Commissions will be performance-related work that is affordable, tourable to arts or non-arts venues or unusual spaces, whilst engaging with Zinc Arts' diverse communities. Enhance offered four commissions to disabled artists/companies. The deadline has now passed for applications, but contact Zinc Arts for details of any future opportunities. Marc Brew Company works with professionally trained disabled and non-disabled artists. Please contact the Company for details of any current or upcoming opportunities. Foot in Hand productions are generally a response to the needs or gaps in current provision. The Company strive to keep them portable, accessible, and relevant. The majority of productions are designed to scale down to accommodate schools or small venues or work as full productions in traditional theatre spaces. Some productions combine disabled and non-disabled professional dancers in inclusive/integrated works. Contact the organisation for details of any current or upcoming opportunities with the Company. Extraordinary Bodies is the UK's only professional integrated circus company, and a partnership between Cirque Bijou and Diverse City. The Company make circus for every body. The Company's first show, Weighting, premiered on 22nd September 2013 and features nine extraordinary artists who dance, sing and fly high above the audience. A 100-strong choir of local singers (including a signing choir) joined the company for the finale of this first show in a participation project that will be replicated when the show tours in 2014. Contact Diverse City or Cirque Bijou for further information on the Company and any upcoming opportunities. The Dance Company evolved from the long-term perspective of providing opportunities for workshop participants to work towards performance. The first production in the North West in 2000 involved three community dancers and three professionals. The current company involves three visually impaired and three sighted dancers, and all are working at a professional standard in performance. A longer period for development and touring takes place to enable the work to develop at its own pace. The Company works with choreographers/directors such as Ray Chung, Angus Balbernie, Julyen Hamilton, Lisa Nelson and Katy Dymoke. Please contact the Company for details of any upcoming opportunities. The Lawnmowers Actors group is a company of professional learning disabled actors who devise and tour work combining comedy and information to support the rights of people with learning disabilities. Please contact the organisation for details of any current opportunities with the group. The Company works with professional disabled and non-disabled actors on productions and projects. Taking Flight has ITC Ethical Manager status. Details of current opportunities are available on the Company's website. Limelight collaborates with professional disabled musicians. Please contact the organisation for details of any current or upcoming opportunities. Limelight runs LEAP, a three year programme funded by the Scottish Government Equalities Department, which aims to create pathways to employment for people with impairments within the performing arts. Indepen-dance 4 is a new inclusive dance quartet creating inspirational and challenging dance. Chosen for their beautiful performance skills, Indepen-dance4 has been working together with Indepen-dance over the past few years to develop this small, tight inclusive group, achieving a high performance standard, with vibrant characters and engaging story-lines. The dancers worked with choreographers from Stop Gap to create their first work for performance, Goldfish. This was toured alongside two other works to professional venues across Scotland. Please contact the organisation for details of any current opportunities with the Company. Green Candle works with disabled artists and practitioners on projects. Their project 'Listening Eyes' saw two d/Deaf and two hearing performers tour a show to young d/Deaf children. Contact the Company for details of current projects and opportunities. The Company works on productions with a range of professional artists - contact the Company for details of any current or upcoming opportunities. The Company works with a wide range of collaborators, performers and artists. Contact the Company for details of any upcoming opportunities. Wicked Fish offers opportunities for professional disabled actors and performers. Please contact the organisation for further details of any current or upcoming opportunities. Develops partnership schemes to extend employment opportunities for disabled artists. Offers one-off commissions to disabled artists and opportunities to work on projects. Please contact the organisation for details of current and upcoming opportunities. Face Front is committed to employing a diverse team of people that will help shape and develop inclusive theatre. In order to do this the Company requires people of all backgrounds, ages, sexes, cultures and talents to join. For audition details, please see website. The Baked Bean Theatre Company is a professional group of actors with learning disabilities which creates vibrant and exciting theatre. It meets twice weekly and offers the chance for talented actors to develop their skills and work with professional writers and directors. Work is performed in London and focusses on issues which affect the group. Heart n Soul provide support to a portfolio of disabled artists, nurturing and developing their careers and promoting their work via digital channels, Heart n Soul events and tours. They also run a number of projects employing disabled artists. Arts & Disability Forum (ADF) produces Bounce, an eight day festival of visual arts, animation, writing, music, performance and theatre which showcases the work of top local and international disabled artists. Further details are available on the website. Triple A Agency is a specialist actors agency for talented actors with learning disabilities. Members have successfully fulfilled many professional contracts in TV, radio and theatre. The goal is to enable more disabled actors to gain real paid work as performers in theatre, TV, film and radio. The Agency aims to challenge public perceptions of what people are perceived to be able to achieve whilst providing a platform for excellent real acting work. Birds of Paradise Theatre Company employs disabled and non-disabled actors and performers. Please contact the organisation for details of current and upcoming opportunities. Mind the Gap employs learning disabled and non-disabled actors. Anjali employs trained learning disabled contemporary dancers. Please contact the organisation for details of current opportunities.